Welcome to the Grammar Gameshow! Test your knowledge in this crazy quiz! The presenter is a bit strange, the points don't make sense and the prizes could use some improvement, but at least the grammar is correct! Mya is on her third win in a row! Is she going to continue the streak? She’s going to have to use all her knowledge of be going to for victory! And be going to is the topic of the show this time. We’re talking future predictions, plans and pronunciation. Do you know it all? Test yourself and find out! Hello and welcome to the Grammar Gameshow! I’m your host, Will! – and where there’s a will, there’s a way! And of course let’s not forget Leslie, our all-knowing voice in the sky. Be going to! Those three little words that are followed by a bare infinitive and let us talk about the future. OK! Now, let’s meet our contestants! Welcome back Mya! This is a hat-trick for you, isn’t it? Yes. I’ve won three in a row! And, do you like hats? Good! I wonder what our prize could be. Ok. Let’s get going and don’t forget you can play along at home too. Our first round is a video round. Watch the video and try to predict what happens next. Well, Mya, what do you think? I think he’s going to sneeze. And what about you, Tom? I think he’s going to yawn. Let’s see who was right… Oh dear. You were both wrong. But if you can tell me why we should use ‘be going to’ here, I’ll give you a point. Fastest finger first! It’s a prediction based on something you can see at the time. Well done, Mya. ‘Be going to’ is used to make predictions about the future based on present evidence. But that’s not fair…where was the evidence that he was going to sing? It was right there! Let’s have a look again. See! One point for you Mya. On to our second question. In what other way can ‘be going to’ be used to talk about the future? Future plans! ‘Be going to’ can be used to talk about future plans. For example: I’m going to take a holiday next week. Not if I can help it Leslie. Well done Tom. Three points to you. Where are you going on holiday by the way? Oh dear! Oh no, no, no, no. Minus three points for lying. Everything to play for now guys. On to our final question. In what way can ‘be going to’ be pronounced in connected or fluent speech? Gonna! Oh! Gonna! People say gonna! For example, I’m gonna win this game! Calm down Tom. It’s not your fault she’s faster than you. Here's a bonus question. People say ‘gonna’, but what should they never do except in informal circumstances? Well done Mya! Two right answers! Tell them Leslie! Yes. People often say ‘I’m gonna’, ‘you’re gonna’, ‘he’s gonna’ in a very informal style, but we don’t recommend that you write it down. Fifty-twelve points to Mya. Well, that brings us to the end of today’s Grammar Gameshow. Let’s count out the points. And the winner is…Mya with six. Well done! Here’s what you’ve won! To go with your hat trick! And you said you love hats! Tom! Bad luck, old friend. Did you have fun? Here come the chickens! It looks like we’ll need another contestant. Thanks for joining us. Say goodbye, Leslie. Be going to is always followed by a bare infinitive verb. I’m going to see my parents. Are you going to travel this weekend? He’s not going to pass his exams. Be going to can be used to talk about future predictions based on present evidence. In other words, a future that can be predicted because of something that you can see, hear, or understand at the moment of speaking. Be careful or you are going to fall! If she keeps swinging her watch around, she is going to lose it. Be going to is also used to talk about future plans. These are things which the speaker has decided on before the moment of speaking. This evening I’m not going to go out. I’ve felt tired all day. Are you still going to take a holiday? You booked it last week. He says he’s going to climb Mount Everest! He’s planned the trip and everything! In fluent speech, especially in an informal situation, be going to is pronounced ‘gonna’ /gənə/. It is rarely written down this way, except in very informal communication. Are you gonna watch the movie? 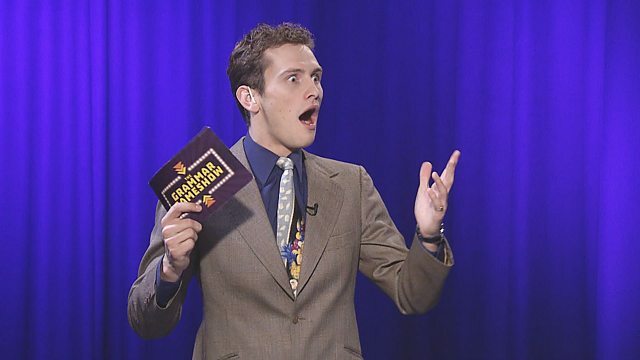 Test your grammar knowledge with the Grammar Gameshow quiz! In which of these future predictions can we NOT use 'be going to'? In which of these cases can you use 'be going to' to talk about future plans? That's all from Leslie and the contestants for this episode. Why not go to The Grammar Gameshow homepage to watch another one?